To many Echo Park residents, the stately multi-storied, brick building that has kept silent watch over Sunset Boulevard for decades, is just another building in downtown Echo Park. There is a pawnshop– and a few other shops that fill its bottom floors. 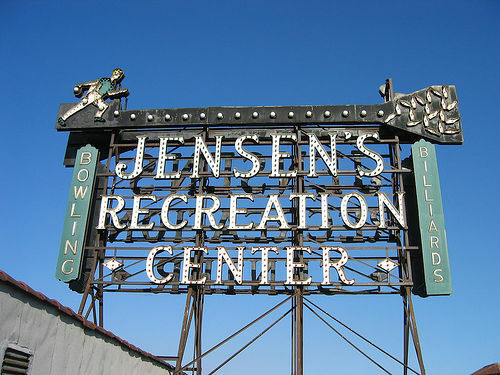 You may or may not have noticed the large, dignified letters engraved in terra cotta, that spell “Jensen Recreation Center,” above the front entrance or the curious illuminated man atop the building that tosses a bowling ball into flickering bowling pins over and over each night. For curious passing drivers and pedestrians, there are few clues to hint at the building’ rich and diverse history. 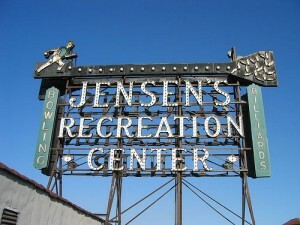 The Jensen Recreation Center was built by the late Henry Christian Jensen in 1924. It was one of several buildings constructed by Jensen in the course of a decade. Jensen was a German immigrant that made his fortune making bricks for the rapidly growing city of early 20th century Los Angeles. His business ventures often combined shopping and entertainment and were predecessors to today’s shopping malls or entertainment complexes such as Universal City Walk. 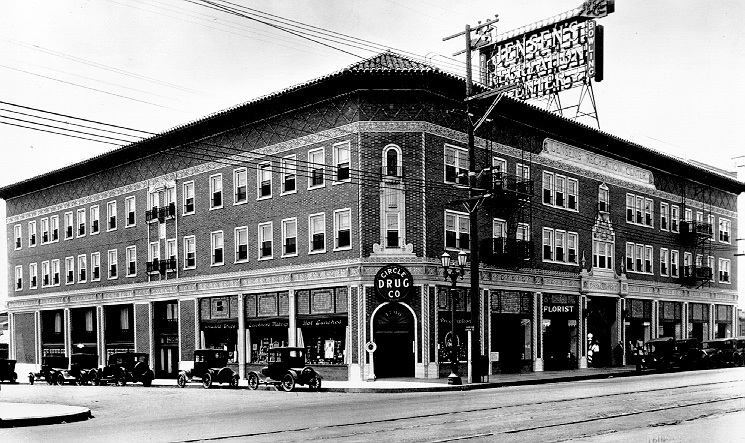 A 1920’s era picture of the building shows a drug store, called “Circle Drug Co” on the southeast corner of the building facing Sunset Blvd. The windows of the drug store advertise “prescriptions, hot lunches, and makeup.” A penny scale sits outside the front entrance of the store that faced the corner of Sunset and Logan and a barbers pole sits just outside of the main Sunset Boulevard front entrance that lead to a downstairs bowling alley and upstairs pool hall. Several model T’s are parked along side and in front of the building. The center was a hub of activity for the neighborhood. Residents coming and going, people dropping in for a bite to eat at the lunch counter, men stopping by for a shave or a haircut, or a quick game of pool. The recreation center often hosted celebrity athletic events and continued to do so until it closed in the 1970’s. Throughout the decades, the building and its retail spaces and apartments have accommodated the ever changing neighborhood. Most of the apartments feature a single living-dining-sleeping area and are packed with built in cabinets, vanities and space-saving Murphy-style beds that folded out of the way when not in use. Benny Bambico, a former Echo Park resident remembers living in the Jenson’s apartments in the 1970’s. His family had just arrived from the Philippines and Echo Park was welcoming place. Today, the building looks much like it did in the 1920’s, with a few exceptions. A section of windows in the space that once housed the corner drugstore have been filled with stucco. And several plastic and metal storefront signs cover the decorative tile work that hangs over each street level window. All signs of the bowling alley are gone. Miraculously, through the years, the Egyptian-inspired ornamentation that wrapped around the walls near the ceiling of the large room, though slightly faded, still exists. Over the decades, the space has been used for everything from an indoor swap meet to a photo studio. 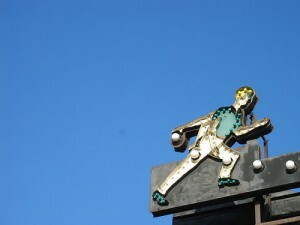 For more that 50 years, the 17×28 foot incandescent sign (illuminated with 1,300 red, green and white light bulbs) atop the building that depicts a bowler throwing a strike was dark. A testament to the neglect and disrepair the building and the neighborhood sometimes suffered over the years. In 1997, the sign was restored to its original appearance through a cultural affairs grant. For many residents, the relighting of the sign was a momentous event that signaled the revitalization of the community and gave the neighborhood an identity. The building was declared Los Angeles Historic Cultural Monument No. 652 in 1998. The grand old building has been a silent witness to the many changes of downtown Echo Park and is about to witness yet another transformation. In 2004, Sebren Development group purchased the building. 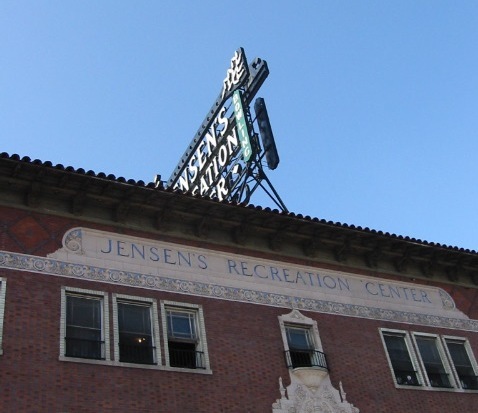 According to Sebastian Rein, president and co-founder of Sebren, his company has big plans for the Jensen Recreation Center. “We’ve already rehabbed many of the apartments and some of the common areas and we just found some of the original pool hall lighting fixtures in the attic and we’re going to put those up. He says they are in the process of removing the various plastic and metal store signs above the retail entrances and replacing them with a single theme signage similar to the originals. While some of the existing retail tenants are staying on, Sebren is lookin for new shops to fill the vacant spaces. True to it’s past, the building will accommodate the changing face of the neighborhood once again.